The 2017 annual enterprise lecture, supported by the Dr Rami Ranger CBE Fund for Enterprise Excellence, will be delivered by Lord Bilimoria, Indian British entrepreneur and founder of Cobra Beer. Lord Bilimoria will discuss his journey as an entrepreneur, sharing his successes, challenges and lessons learnt. Guests will also hear about the work undertaken in the past 12 months as part of the Dr Rami Ranger CBE Centre for Graduate Entrepreneurship. In 2014, LSBU's dedication to graduate entrepreneurship attracted a substantial gift from global entrepreneur Dr Rami Ranger to set up the Centre, and since then the University was named Entrepreneurial University of the Year at the Times Higher Education Awards 2016. Dr Ranger founded Sun Mark Ltd in the 1970s with just £2, a typewriter, a car and a self-storage unit. 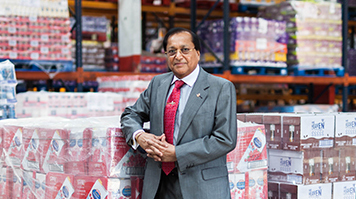 Sun Mark is now the only company to have ever won the Queen's Awards for Enterprise for International Trade five times in a row. His continued support of LSBU is thanks to the University’s enterprising spirit and diverse student body. “Where I am today is a far cry from where I started. Education enriched and shaped the futures of myself and my siblings. I started with nothing and now have the opportunity to help others make the most of their lives,” he said when the Centre was opened. LSBU’s Director of Research, Enterprise and Innovation, Gurpreet Jagpal, said the lecture was one of many events scheduled this year that would celebrate the past, present and future of LSBU. “LSBU has been a pillar of the community for 125 years, transforming lives, businesses and communities, and helping almost 275,000 students to achieve their goals,” he said. “As pioneers in embedding enterprise in education, we are thrilled to be able to hold events for the LSBU community with inspirational speakers such as Lord Bilimoria, and we are incredibly thankful for the support of Dr Ranger. This lecture will bring together students, LSBU staff, entrepreneurs, partners and stakeholders with an interest in enterprise and small and medium-sized enterprises to share experiences and celebrate their successes. Register online to attend the free lecture.